UK based organizations may have a requirement to have their data at rest in a UK based Office 365 datacentre. It may be to satisfy compliance requirements or due to the upcoming Brexit. Microsoft has an answer for organizations that fall in this category - move your data back! That is right. Organizations can request their core data to be moved from an existing EU datacentre to one based in the UK. Requests have to be in before 15th September of this year, which means there is one month left to take action. Microsoft will take upto 24 months to complete the actual move and customers will be notified with a message once the move has been completed. As the process can take upto 24 months, it will put organizations who wants to move the data back to the UK (because of Brexit) in a difficult position. 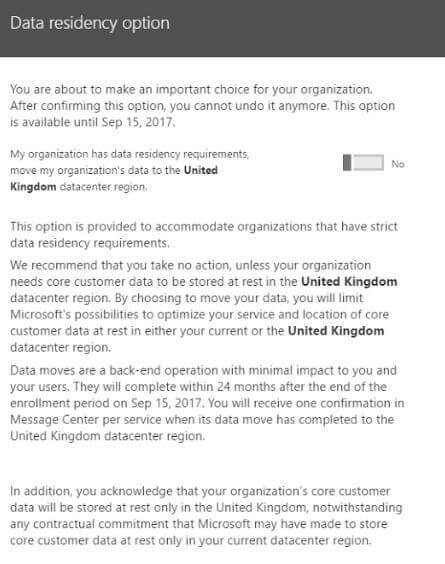 In order to let Microsoft know that you want to move your data to a UK based datacentre, login to the Office 365 admin portal and navigate to Settings -> Organization Profile -> Data Residency option & click the Edit button. In the new window, turn on the toggle switch to say that you want the data to be moved back to the UK. ​If your data is already in a UK based datacentre, this option will not be available. The Data location option will show you the location of your Office 365 services. Microsoft has three datacenters within the UK at the time of writing, in London, Cardiff and Durham & all three of them host Office 365 services.